The chinchilla’s gestation period is 105-155 days which is substantially longer than the dog or cat. This longer period results in well-developed offspring that have open eyes and full hair coats when born and eat solid food within several days. Recycled paper bedding such as Yesterdays NewsTM or CarefreshTM, are bio-degradeable and tend to be non-irritating to the chinchilla’s skin or respiratory tract. They are therefore suitable choices for chinchilla bedding. Seeds have a high fat content and poor nutritional balance and so are not recommended for your chinchilla. Chinchilla Deluxe from Oxbow Animal Health provides a balance of fiber, protein, carbohydrates, fats, vitamins, and minerals and is the pellet diet of choice for your pet chinchilla. As a general rule, we recommend feeding 2 tablespoons of Chinchilla Deluxe to each adult chinchilla on a daily basis. The quantity of Chinchilla Deluxe fed to growing and pregnant or lactating chinchillas should be increased to approximately ½ cup or more per day. Conversion from a seed/pellet mixture to this highly palatable diet is usually simple, but a gradual conversion (1-2 weeks) is recommended to avoid digestive upset. Pellets can be fed in a sturdy crock bowl. Dishes should be cleaned daily, and any leftover food discarded. We recommend feeding the adult chinchilla 1/8-1/4 cup of Oxbow Animal Health’s Chinchilla Deluxe pellets along with unlimited quantities of a mixture of alfalfa and timothy hay. Many owners want to offer treats to their pet chinchillas. A treat should be enjoyable to eat and should provide interaction between you and your pet. When fed in limited quantities, herbs (fresh or dried) and vegetables can be offered as treats. Herb choices include mint, basil, oregano, and thyme. Fresh greens might include romaine, butter crunch, or red leaf lettuces or cilantro, carrot tops, and dandelion greens. Chinchillas can thrive on either grass or legume hay. Veterinary nutritionists and clinicians usually recommend feeding an assortment of grass hays free choice and mixing in alfalfa hay if desired (at a 50:50 ratio), for variety and increased levels of protein and calcium. Oxbow Animal Health Products timothy, orchard, oat and alfalfa hays are always fresh from the farm. When it comes to feeding a concentrated ration, we recommend alfalfa-based pellets that contain more than 18% fiber and a minimum of 10% protein. This open mouth view of an anesthetized chinchilla with dental problems shows what overgrown lower right molars (arrow) look like. They have disrupted the natural movement of the tongue and are causing mouth discomfort. 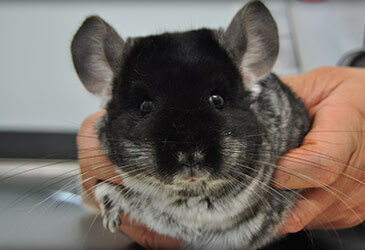 Chinchilla’s with dental problems will decrease the quantity of food they ingest and eventually become sick. Other signs to look for include wet fur on the chin as a result of increased salivation and picking up and dropping food in awkward attempts to eat. Donnelly TM, Schaeffer DO: Disease problems of guinea pigs and chinchillas. In : Hillyer EV and Quesenberry KQ, eds. Ferrets, Rabbits, and Rodents: Clinical Medicine and Surgery. Philadelphia, WB Saunders, p270-281, 1997. Hoefer HL, Crossley DA: Chinchillas. In: Meredith A and Redrobe S, eds. BSAVA Manual of Exotic Pets, fourth edition. Gloucester, England, British Small Animal Veterinary Association, p66-75, 2001. Wolf P, et al: The Nutrition of the Chinchilla as a Companion Animal-basic data, influences and dependences. Journal of Animal Physiology a. Animal Nutrition (87) p129-133, 2003. Grau J. The chinchilla – breeding in various climates [in Spanish]. Infochin. Available at: http://www.infochin.com.ar/grau/r.html . Accessed July 28, 2002.